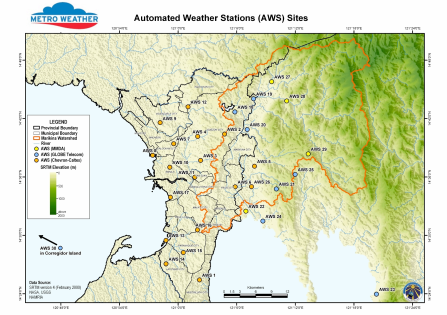 Metro Weather is a public-private partnership that has established a network of 30 automated weather stations (AWS) in Metro Manila. This network will provide free and near real-time weather data that can be used to prepare for severe weather conditions such as tropical cyclones and heavy ﬂooding. The weather stations are spread over the cities and municipalities throughout Metro Manila. The project partners are Chevron, the Manila Observatory, Globe Telecom, the Metro Manila Development Authority (MMDA), and the Ateneo de Manila University (ADMU). The weather monitoring station project of Makati City was formally launched in Barangay San Lorenzo by Makati City Mayor Jejomar Erwin Binay, city ofﬁcials and barangay kagawads. Manila Observatory (MO) will assist in Makati City’s Disaster Risk Reduction (DRR) work through the weather monitoring project by providing instrumentation support, and assisting in information exchange and climate analysis. Seven automated weather stations evenly distributed around Makati City have been set-up and with the data available on-line. 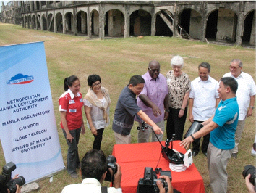 The Corregidor Automated Weather Station was launched in November 2012 as part of the Metro Weather network. The weather station in Corregidor is vital to the Metro Weather network as it will provide the only source of weather information for the continued conservation of the island’s ecosystem: which commemorates the long-history of the friendship between the Philippines and the United States of America; and, it will provide the ﬁrst source of information on extreme weather which may be approaching Metro Manila from the West Philippine Sea.